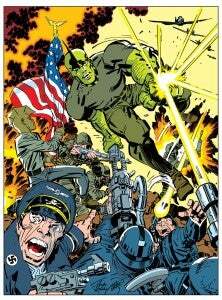 Savage Dragon and Son By Jack Kirby...Wait, What?! 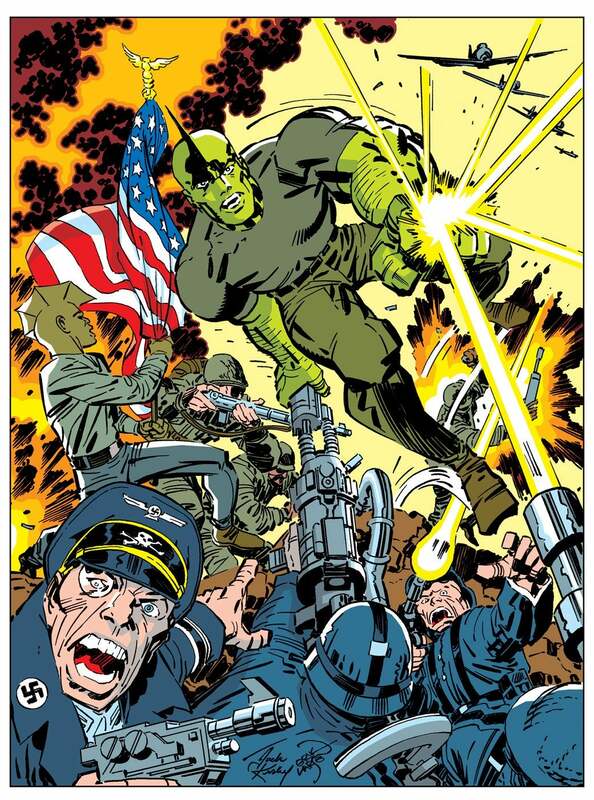 A color print that was offered at the recent Calgary Fan Expo showed comics legend Jack Kirby pencilling Erik Larsen's creator-owned character Savage Dragon and his son Malcolm. Inked by Larsen, the image (seen at right) might seem an unlikely mix of talent and subject matter--and you'd be right, although the image is legitimately Kirby. "This was a drawing I did over Jack Kirby's pencils for the Jack Kirby Museum," Larsen posted to Facebook late last night. "It was originally Captain America and Bucky but I couldn't use them. My thought was to try and create what would have been the ultimate Kirby pinup of Savage Dragon." Asked whether he actually inked it over Kirby's pencils, Larsen further explained the process a bit, saying, "To make it--I scanned in Jack's pencils--made modifications in Photoshop and printed it out in light blue onto an Image Comics art board. Then, I inked that--so, yes, I did ink over Jack's pencils." It's a cool piece not just on its own, but because if you know the backstory you can try to figure out what elements of the image were changed and in which way. We're guessing that laser blast was originally bouncing off a shield.